The City’s Public Arts Committee is inviting artists to submit their qualifications to create an iconic, site-specific piece of permanent public art to be installed in the Cradle of Country Music Park downtown. The deadline for submitting a proposal is Tuesday, Jan. 16, 2018. Public Arts Committee Seeks Proposals for Mural in 500 Block of S. Gay St.
Perhaps you’ve noticed it: The large overhead rectangular slab of white concrete in the 500 block of South Gay Street, framed by red brick. And maybe you’ve thought to yourself: That space resembles a canvas awaiting an artist’s inspiration. 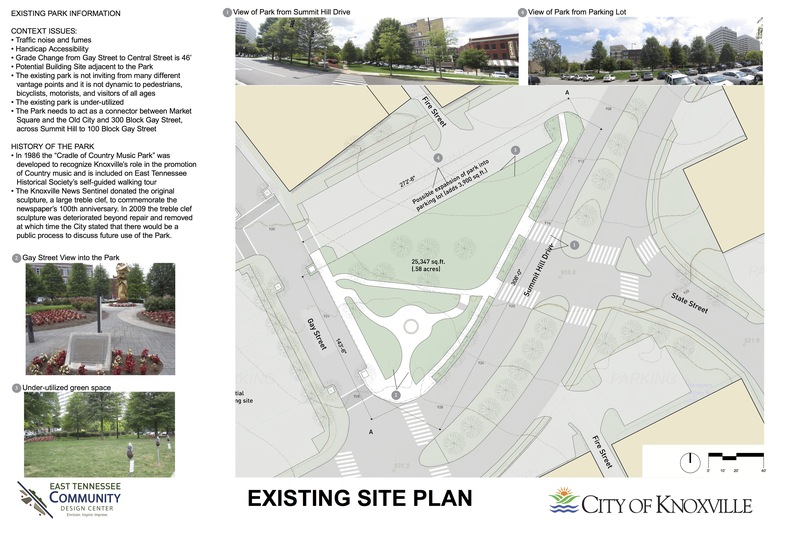 That’s exactly the opportunity seen by the City of Knoxville’s Public Arts Committee – the panel that’s adding public art throughout the downtown area. The committee is inviting artists and artist teams to submit qualifications for a permanent work of art for the 12-foot-10-inch by 7-foor-3-inch white space – either a mural or a waterproof piece to be affixed to the wall on the east side of Gay Street, near the intersection with Union Avenue, just north of Nama restaurant. The space is above the opening to the elevated walkway to the State Street Garage. The deadline for submitting a proposal is Monday, Jan. 30, 2017. The City of Knoxville’s Public Arts Committee invites artists and artist teams to submit qualifications for a permanent work of art to be located in front of the main entrance to State Street Garage in downtown Knoxville. In past years, the State Street entrance to the garage has been adorned with temporary public art installations. A concrete pad for sculptures was installed, measuring 90.5 inches wide by 123 inches long. Lighting also has been installed and would be available to light the sculpture, which would be owned by the City as a part of its permanent art collection. The deadline for artists or groups of artists to submit their qualifications is 5 p.m. Thursday, Dec. 15, 2016. It’s a wide and well-used path: 43 steps, 10 feet across, used by thousands of pedestrians on peak days as they trek the Second Creek Greenway to access World’s Fair Park, the University of Tennessee or downtown Knoxville. The stairs south of Cumberland Avenue, at 11th Street near World’s Fair Park, also are plain concrete – and the City’s Public Arts Committee believes this important pedestrian entry point to the Second Creek Greenway is overdue for a fresh look. The deadline for submitting a response to the Public Arts Committee’s RFQ is Monday, Nov. 21, 2016.